With a warm inviting interior, the large and fully equipped bar provides a great space for parties and receptions. Flexible seating includes bar seats, tables, and booths as well as ample standing room, allowing groups to relax and enjoy themselves in a comfortable setting. Includes state-of-the art sound system for DJ or small band performances, as well as TV monitors with Direct TV and DVD capabilities. Additional Chapel Bar Options: - Available as part of a larger package with The Chapel Music Room. Windows can be opened to allow views of the stage, and speakers/monitors can broadcast stage activities. - Available as part of a restaurant buy-out. Perfect for a pre-dinner reception, or as a way to increase the number of guests. A wall divider can be opened to allow guests to occupy both rooms. A semi-private dining space seats 20 and can be combined with show tickets for a complete evening out. Advanced notice required. The historic chapel combines gorgeous ambiance and professional audio, sound and video equipment to create an unsurpassed venue for special events. There is a large stage for performances, weddings, and presentations, as well as spacious ground floor, mezzanine, and balcony spaces with various seating options. The Music Room with Mezzanine also offers two full bars and private dressing rooms. Available as a separate rental from the main floor of The Chapel, the Chapel Mezzanine accommodates guests reception style, or can be set up as a seated event for social mixers or private parties. 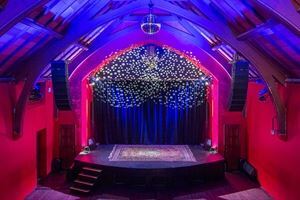 The Chapel Mezzanine can be also reserved as a buyout during regular music shows with advance notice, and its position overlooking the main hall and stage provides preferred vantage points for performances. Private balcony, bar and restroom all included. A separate staircase outside the music venue creates a private entrance for guests. Beautiful sunny patio with stucco walls, custom ironwork railing, and nighttime heating and lighting can be set up with a private bar. The Outdoor Patio can also be combined with restaurant or music room rentals to allow for outdoor receptions for private events. The charming restaurant space is accented with wood and stained glass trim, granite bar, and gorgeous chandeliers. The Chapel Restaurant offers delicious full dinner or banquet menus and a full bar with handcrafted cocktails and carefully selected wine and beer. The restaurant can also accommodate small bands and DJs.